Quiet Executive Apartment, features a fully fitted kitchen with washing machine/dryer, microwave and Wi-Fi. The rooms are located from the Lower Ground Floor Up. They have an Open Plan Layout with Full Kitchen, King size or Twin Beds, Flat Screen Television with Sofas that fold out into Sofa Beds. All our Standard Studios Apartments are 17mq, located on the lower ground floor. Each Apartment has a fully equipped Kitchen, DVD Player, Complimentary Bath Products, Air-con, Welcome Pack. Presidential Serviced Apartments in Kensington are located in one of Central London`s most desirable and well-heeled locations. 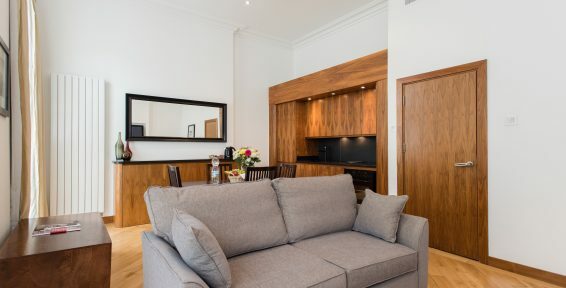 Located only 2 minutes walk from Earl's Court Underground Tube Station, served by Piccadilly and District line, it is easy to reach not just all the London's most popular tourist attractions but also Heathrow Airport and Kings Cross St. Pancras Station for Eurostar. 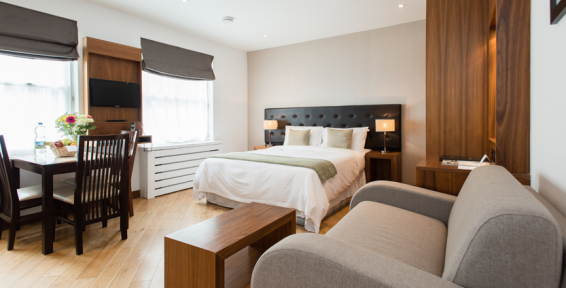 Our Kensington Serviced Apartments in Earls Court are surrounded by London's best shopping areas including typically upmarket Kensington Highstreet, Knightsbridge, Harrods, and the fashionable Kings Road. Westfield Mall and Oxford Street are also less than 10 minutes tube journey and are equally accessible. The top London nightclubs and bars are also easy to reach from Kensington. Famously known as Museum Quarter, Kensington has London's top three museums including Science Museum, Natural History Museum, and V&A Museum. Open green spaces include Kensington Gardens and Hyde Park. Other Notable attractions in Kensington include - Kensington Palace and Royal Gardens, Royal Albert Hall, Earls Court Exhibition Centre, Olympia Exhibition Hall, Royal College of Art, and Albert Memorial. 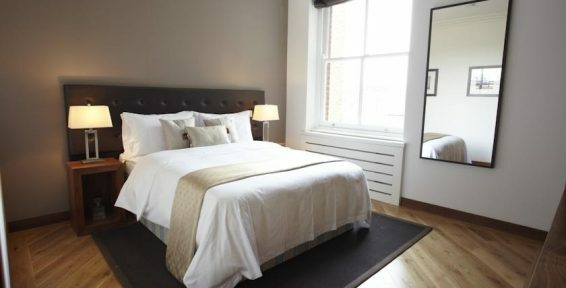 Presidential holiday apartments London offers fully equipped studios and one bedroom apartments that are a combination of stylish amenities and timeless elegance. 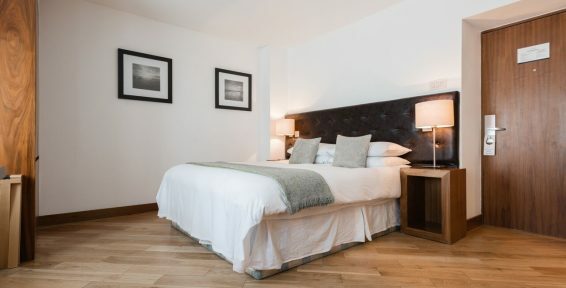 All our apartments are perfectly suitable for a short or long term stay and are all furnished with exquisite interiors and modern facilities to ensure your stay as comfortable as possible. 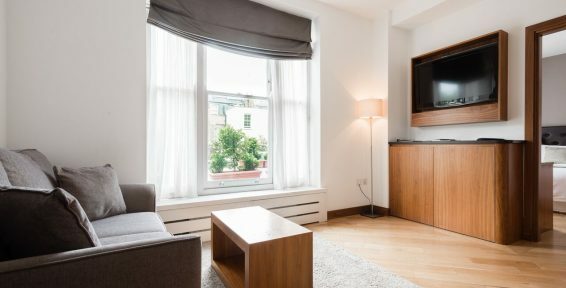 Our serviced apartments in Central London have a fully equipped kitchen with microwave, oven, stove, fridge freezer, dishwasher, a Bosch extractor and a fully integrated washer/dryer and a number of important kitchen utensils. Enjoy our complimentary high-speed wifi and DVD library available to borrow. High definition plasma TVs with a DVD player are all set for your entertainment if you want to enjoy some of your own collection in the apartment. 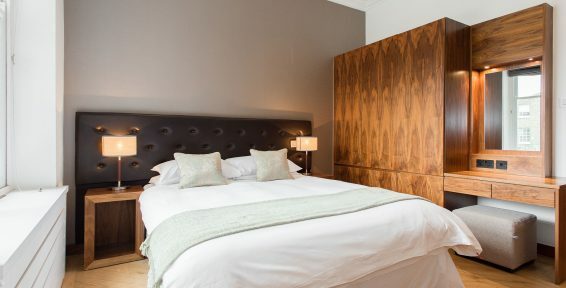 These serviced apartments are fitted with pattern Siberian Oak floor and adorned with a range of elegant furniture. Sofa beds are available in some of the apartments in case you want to accommodate some extra guests. Some of our apartments also have private balconies/patios or access to the communal courtyard. 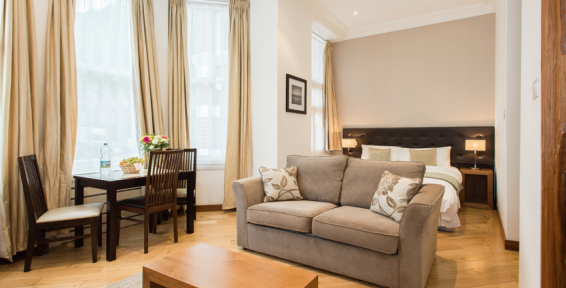 The Presidential Kensington Serviced apartments offer a comprehensive range of guest services that will guarantee an enjoyable and relaxing stay.